Primalia - The Caveman Set! This is long overdue. A primal set is the linchpin this community needs to launch itself on a new level. This had to happen sooner or later, so here we are! White - The Social side of early humans, token spawners (like tribes and whatnot), caveman leaders and priests, that sort of thing. Blue - The Cognitive revolution. How people dealt with this new plane of intelligence they had. Just flat-out blue spells in their most primal form. Intelligence FTW! Black - The Holistic medicine and voodoo kind of side. The ancient humans had some weird ways about magic, and this world will have even weirder views (cause, you know, magic's real... Cause's that's the title of the game...) and you bet black will be there to exploit it! Red - The Cultivation of fire. Self-explanatory. Make humans taming fire to overcome their animal side. Green - The Wild side of ancient hoomans. The savage side. The primal side. They only evolved from high apes a couple thousand years ago. We are still in the brainstorming phase, so don't worry about making a balanced number of commons-mythics and a mana ramp. That will come in future steps. I won't declare any awards or prizes... at least for now. This is a community project, not a contest. Right now, just go wild and create cards for the set. Good smithing to you! Live long and prosper! Not enough good artworks for this kind of thing. I'll drop some here to make it easier. Sounds like an awesome name for a character! Oh, ok. Wait... Could the location be ancient Murraganda? 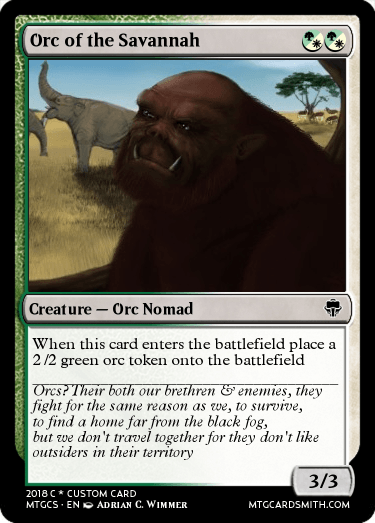 @HeroKP It could be if you wanted to, but keep in mind that Muraganda has a lot more going on than the theme you want to go for. If you want to stick to the "cavemen moving out of Africa" theme, I would recommend using a new plane, especially if you want to do Pleistocene megafauna instead of Dinosaurs. Ok. I'll take your advice. We could use inspiration from Murraganda, but make some things different. But anyway, Primalia sounds like a derpy and unimaginative name. Do we have anything better? I know it's early, but this is just a random idea I had. It probably needs improvement, but I thought the wheel was a good idea. this is still being worked on right? Huh, interesting card creation tool. Never heard of it before. How recently did it release publicly? I've done a bit of messing around with it. I like it a lot, but not as much as MSE. Granted, this is with me using some of my most template-breaking (as in using existing card templates to their full size and potential) card designs as the testers. 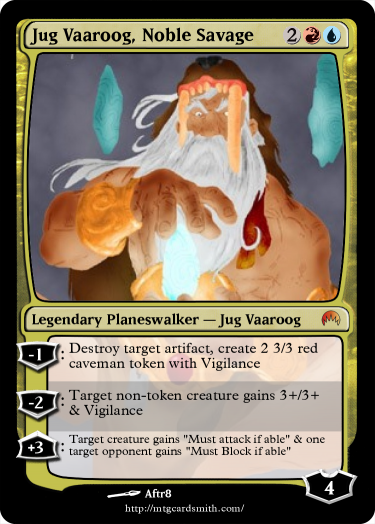 Certain planeswalker designs in particular have proved to be an issue when I have really lengthy abilties that don't fit the box even at the smallest text size. There's also a bit of a lack of customization of the templates, though mainly in very minute areas that are insignificant in most cases. Other than that, it looks pretty great! The foil overlay in particular looks great and really makes the cards shine (no pun intended). @Arceus8532 It's quicker than MSE but it needs more contents. Although you also couldn't edit the picture too, it's overall somewhat better than the Cardsmith due to its nice text positionings and other formatting things. My golden standard for custom card creation is the mainframe templates released by Cajun. If an editor can surpass the customization and versatility of those, I'll be thoroughly impressed. I think we need to think of the possible story of the set. Not just the backdrop, but the concrete figures and conflicts. Mm, it would possibly be wise to have the story made through and through. Maybe try and think first what each color (and/or color combo) is represented by. Black for instance could be the mentioned Black Fog. Maybe those who stay in it for too long become transtormed and dismembered, remade into deadly beast that survive only in the fog, fighting each other and corrupred plants of nature. However, some of the lucky are able to withstand the fog, and those lucky few may be the only ones who can find its source and stop it. Two brothers and a sister from one of the 20 great tribes (kinda like guilds of Ravnica, but tricolour and have a different mechanic [to be thought out more]) get lost in the fog. Because of their pure and innocent nature, they aren't fully corrupted and turned into abominations, however only one avoids the effects completely. One of the boys's mind gets touched by the dark, and he inherits some of the power of the fog, giving him B/G magic and igniting the first ever planeswalker spark on Primalia (please give me a better name). He tries to invoke his siblings into this too, however they shudder in disgust and fear at their brother. The sister is scarred for life, when the corrupted brother tries to pull her in, she explodes in fiery flame, igniting her spark and becoming the second planeswalker on Primalia. Hurt by the brother and sister's disregard, the corrupted child uses his powers to transport them away from the fog, out of his sight, onto another continent (one that is uninhabited by humans or nymphs yet, and is home only to the wolfolk (basically humanoid wolves), who have just achieved sentience. After wandering for nearly a year, the 3rd child swears to destroy the fog and bring back the brother he used to have. The oath ignites his spark, and gives him powers of blue and white, the 2 colours the fog seems to lack in it's raw magic arsenal. The wolfolk witness the spark igniting, and swear to be loyal to the brother and sister as their king and queen. In the end, we have 2 growing armies, with the light brother making plans to find his way back home to fight against the fog, and the dark brother making plans to attack the other humans and add them to his never-eding horde of nightmares. And the sister is still wandering the south of the remote continent.